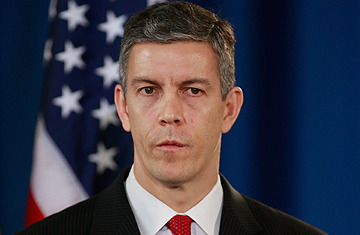 Education Secretary Arne Duncan says the federal court ruling is a “win” for students and taxpayers. The U.S. District Court for the District of Columbia ruled Tuesday that the Department of Education can demand that for-profit schools prove that their graduates make enough money to repay their student loans. The new rules stipulate that career training programs must show that the estimated annual loan payment of a typical graduate does not exceed 20 percent of the recipient’s discretionary income or 8 percent of total earnings. The plan, which goes into effect July 2, was announced last fall as part of the Education Department’s effort to end the predatory practice of fraudulent colleges targeting low-income students because of their access to federal student loans and military benefits. Programs that don’t pass the “gainful employment” standards risk losing access to federal money. The administration estimates that 99 percent of the training programs that will be affected come from the for-profit sector. U.S. District Judge John Bates dismissed that argument and completely left the regulation intact.